Laura Jeffers, MEd, RD, LD is an Outpatient Clinical Manager and the primary metabolic dietitian at Cleveland Clinic's Center for Human Nutrition. She has been a dietitian for nine years and has experience in weight management, allergies, gastrointestinal disorders, and general pediatric nutrition. She has been practicing metabolic nutrition for eight years and has been the Outpatient Nutrition Manger in the Center for Human Nutrition at Cleveland Clinic for the past five years. 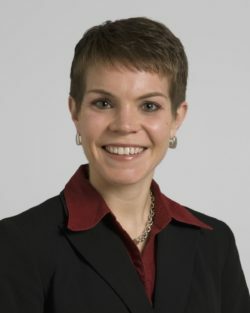 Laura Jeffers is Founder and Manager of Cleveland Clinic's Eat Right at School program as well as a member of many other programs, including Pediatric Nutrition Practice Group, Academy of Nutrition and Dietetics, Ohio Dietetic Association and Cleveland Dietetic Association, and the Diabetes Care and Education Practice Group. She is an advocate for her staff and patients and is a motivation to her peers. She is personally committed to nutrition and health and shows by her example as she has completed 23 marathons in 12 years. To request an appointment with Laura Jeffers, please call 216-444-CARE or visit the Online Appointment Request form.